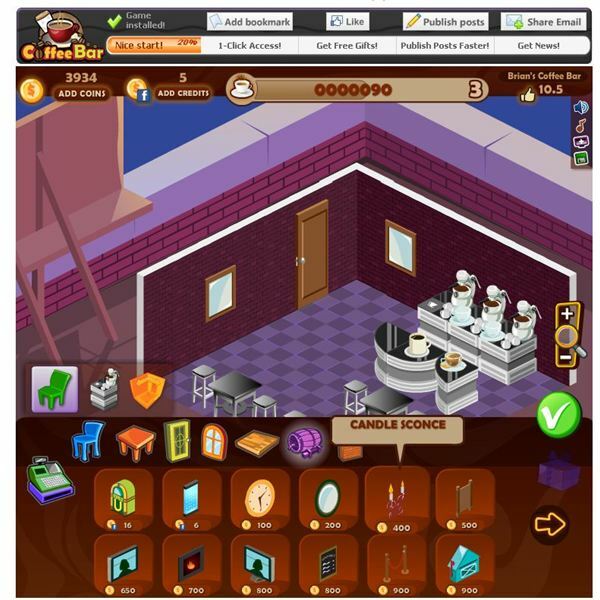 Coffee Bar plays like many of the café game such as Café World on Facebook. In this one you don’t serve any food, just coffee and a few other beverages. In your shop you can use the coffee machines to make your drinks and place them onto countertops for your customers. Your establishment can be filled withseating and another decorations for your own unique look. As you advance you can add more coffee machines and countertops to increase your production of drinks and have more available for your guests. Players have the ability to customize the look of their avatars with different outfits, and hairstyles. You have played this type of game before on Facebook and Coffee Bar follows the same basic formula. You make something to serve to your guests and use the money to upgrade or decorate your shop. You advance through the game by creating additional drinks to level up. After you serve a drink you need to clean your coffee machines before you create the next one. You’ll want to expand your shop right away because your game area is quite cramped leaving you with not much room to work in. You’ll find yourself clicking avatars more than the coffee machines and bringing up annoying menus. The game itself looks good with some decent color, although the avatars aren’t the best looking. Some outside scenery would be nice too since you can only see inside the coffee bar. The interface icons are very simple so you won’t be confused like other Facebook games similar to this one. Coffee Bar is still just an average game, like many of the social games on Facebook. Coffee Bar has the standard decorations such as tables chairs, windows wall coverings, and flooring. There’s a couple of nice ice sculptures but nothing that stands out at you. Wallpaper and flooring is pretty basic and bland looking. Overall the decorative options are a big disappointment and the game needs something to give your shop a personal touch or flair. As it stands now the game is lacking in the decorative department. While you don’t need credits to buy and of the items there currently in the game store there’s just not enough selection. Currently you can only add a white or black coffee maker and a few different serving tables, there should be more selection here. Coffee Bar is an average game and does nothing to enhance the genre of café games on Facebook. The game looks fine graphically but doesn’t add any extras like outside scenery. On the decorative side the game fails to impress with not enough options and little extras you would expect to see. If Coffee Shop adds these in the game could become better. As it stands right now Coffee bar really isn’t worth playing since Facebook already has great café games such as Café World.